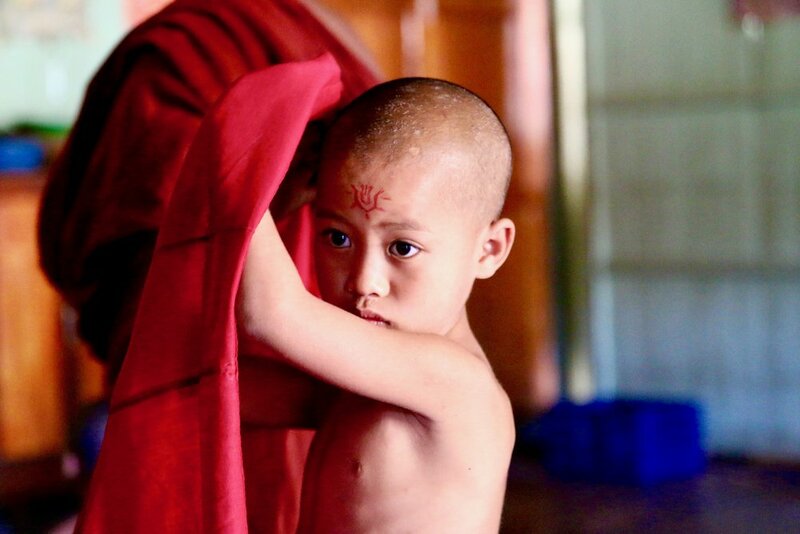 I didn't know what to expect when I scheduled a week in Myanmar before heading off to China; I assumed I would spend the entire time in Yangon wandering through the streets as I usually do. However, after my first day there walking 15+ miles and visiting nearly every sight I could fathom, I realized that I would not be able to spend a week there. So instead of staying in the city, I immediately latched on to a fellow traveler, took an overnight bus to Bagan, and went exploring. There, I spent my days whizzing around on motorbikes through sandy roads filled with thousands of temples, playing with displaced monk children, eating Shan noodles, climbing trees and ancient shrines, speaking to locals about the humanitarian crisis there, getting food poisoning from Thai food, falling lots, and drinking local Myanmar beer with the other backpackers at my hostel in the evening. As my friend from home described it, it sounded like "peak Safia." I was supposed to fly to Beijing on the 31st, but ended up extending my time in Myanmar after realizing how beautiful it was and how much I would be missing out on if I left so soon. I took another overnight bus to Inle Lake, where villages and temples are built on stilts on the water. The people transport solely by boat, thriving off fishing and tourism. We were able to see the Long Neck Tribe, watch silver being made and silk being woven and banana cigarettes being stuffed with tobacco by elderly women laughing away to each other. Rain crashed down on our little boat, while soaked my clothes but made it even more of an adventure. After our boat journey, we took bikes out to a little vineyard for a wine-tasting ($5!) and a hike up to the forest monastery in a remote village miles away from Western-esque anything. I celebrated New Years at some ex-pat bar, filled with drunk tourists blasting music and dancing in the middle of this country where so much of the world is currently looking at. Eventually I had to complete my journey and fly off to Hong Kong, after being placed on bus after bus after bus in the dead of night. Despite being stranded at unofficial bus stop in the rain at 1am with no internet or knowledge of the local language, I never had a single feeling of fear or danger; one of my favorite things about Myanmar is how friendly the people are. During my entire trip, I did not encounter a single person who would not smile back at me, or offer me whatever hospitality they could. The country, even the most touristy spots, are incredibly raw and real. Also, everything is incredibly cheap - make sure not to avoid the local spots on the side of the road, because from my experience they are not only the least expensive, but the most delicious and comes with the best service (I feel like I got a new mom). Even though I extended my trip, there is no doubt that I want to return to Myanmar and visit everywhere I couldn't my first time around. I often find myself conflicted on my travels, not wanting to just be another clueless tourist, especially in a place as controversial as Myanmar. However, by knowing the history and making an effort to give back to the local community through tourism or just getting the resident perspectives on issues where the conversation is usually dominated by the West makes a big difference. Therefore, I will be soon releasing an interview I did with a local from Bagan on the Rakhine Muslims, also known as the Rohingya. The people I met (both locals and fellow travelers), the amazing sights, the beautiful Buddhist traditions that I learned about, all made it one of the most fantastic trips of my life. The fact that it was my first time truly backpacking alone was terrifying at first, but now I'm incredibly grateful for the experience.